Source: BBG website, July 28, 2013. Check here for updates. 502.3 Availability of program materials on public websites. 502.4 Media or organization one-time requests for broadcast quality agency program materials. 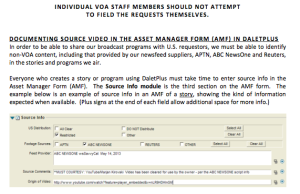 502.5 Media or organization requests for ongoing subscriptions to broadcast quality agency program materials. § 502.1 Authority and scope. Defense Authorization Act for Fiscal Year 2013, Pub. L. 112-239, as codified in 22 U.S.C. §§ 1461, 1461-1a and the U.S. International Broadcasting Act, 22 U.S.C. 6201 et seq. (b) Scope. This part applies to the public and all divisions of the Federal Government supervised by the Broadcasting Board of Governors under the U.S. International Broadcasting Act of 1994 (collectively “the Agency”). These regulations only cover the procedures for responding to domestic requests for Agency program materials. 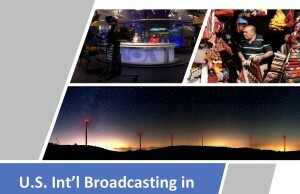 (1) The Broadcasting Board of Governors supervises all U.S. non-military international broadcasting activities in accordance with the broadcasting principles and standards in the U.S. International Broadcasting Act of 1994, 22 U.S.C. 6201 et seq., including consistency with the broad foreign policy objectives of the United States. (3) It is the Agency’s policy to make its program materials available, upon request, whenever doing so is consistent with all statutory authorities, prohibitions, principles, and standards. However, the Agency reserves the right to deny requests for program materials under circumstances described in Section 502.7 of this regulation. (4) Pursuant to section 501 of the U.S. Information and Educational Exchange Act, as amended, as codified in 22 U.S.C. 1461, the Agency may, upon request, provide members of the public, organizations, and media with program materials which the Agency disseminated abroad, in accordance with these regulations. (ii) Make program materials available in the Unites States, when appropriate, and in accordance with other applicable law. (a) Media entity means any person or entity, that actively gathers information of potential interest to a segment of the public, turns gathered information into a distinct work, or distributes that work to an audience within the United States, and otherwise serves the purposes described in § 502.4. (b) Organization means any corporation, trust, association, cooperative, or other group organized primarily for scientific, educational, service, charitable, or similar purpose, including but not limited to institutions of higher education, and otherwise serves the purposes described in § 502.4. (c) Program materials means radio broadcasts, television broadcasts, and Internet content that the Agency disseminates to audiences outside of the United States, pursuant to: The U.S. Information and Educational Exchange Act of 1948 (22 U.S.C. § 1461 et seq. ); The U.S. International Broadcasting Act of 1994 (22 U.S.C. § 6201 et seq. ); The Radio Broadcasting to Cuba Act (22 U.S.C. § 1465 et seq. ); or The Television Broadcasting to Cuba Act (22 U.S.C. § 1465aa et seq.). (d) Requestor means any private person or entity within the United States that requests program materials from the Agency. § 502.3 Availability of program materials on public websites. (a) The Agency makes program materials available to Requestors through the Agency’s news and information websites designed for foreign audiences. 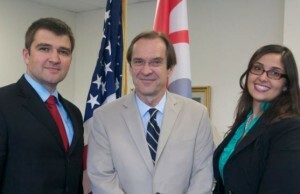 To access currently-available Agency program materials, please visit www.voanews.com and www.martinoticias.com. The homepages of these websites display a portion of the Agency’s most recent news reporting. Additional program materials are available through the websites’ search functions. (b) Program materials are available on Agency websites after their dissemination abroad, and may be removed from Agency websites solely at the Agency’s discretion. TheAgencywillremoveprogrammaterialsfromAgencywebsites whenaNational Archives and Records Administration (NARA) records schedule goes into effect, or when required by licensing agreements with third-party copyright holders. Once these program materials have been removed from Agency websites, they are no longer available from the Agency. (1) When full programs are removed from the Agency’s websites in accordance with a NARA records schedule, programs designated as permanent will be transferred to NARA. For information on how to request Agency program materials that have been transferred to NARA, see the Agency’s records schedules and NARA’s regulations at www.nara.gov. (2) Programs designated as temporary under a NARA records schedule will not be retained by the Agency once they are removed from the Agency’s websites and are no longer needed for the Agency’s use. (c) Segments incorporated into final programs, including music, interviews, reports, and other program elements, will not be transferred to NARA independently of full program recordings, and will not be available after they have been removed from Agency websites. (d) Draft program materials, and any other program materials not selected for dissemination abroad, are not available. (e) The Agency shall determine the method of making program materials available, as well as the file type, file format, resolution, and storage medium(s) that are available. Program materials are only available in the same form (i.e. radio or television file-type and file format) and language in which the Agency disseminated them abroad. § 502.4 Media or organization one-time requests for broadcast quality agency program materials. (b) The TV Marti Division of the Office of Cuba Broadcasting for broadcast- quality copies of TV or Radio Marti program materials. (b) Media entities, or other organizations, may request ongoing subscriptions by filling out an application form found on the website for the Direct System, the Agency’s professional distribution system. (2) The Requestor agrees that he or she shall secure all necessary licenses from all persons or organizations that hold a copyright in any portion of requested program materials before making any use of those program materials, except uses of program materials permitted by the Copyright Act of 1976, as amended. Permitted uses include: use of works for which copyright protections have lapsed or expired; use for private viewing, study, scholarship, or research purposes; or uses permitted under the fair use provisions of 17 U.S.C. 107. (4) If providing the requested materials would be inconsistent with the Agency’s statutory authorities, the broadcasting element’s charter, or any applicable law or regulation. (b) For more information on the criteria for accepting or denying requests, please see the Agency’s policy for domestic distribution, available at www.bbg.gov. incurred to fulfill a request for Agency program materials, including ongoing subscriptions for Media entities and one-time requests for broadcast-quality copies of Agency program materials. Fees charged for ongoing subscriptions, if any, will be outlined in an agreement between the Media entity and the Agency. (c) The Agency reserves the right to establish and change fees in accordance with applicable law and regulation.